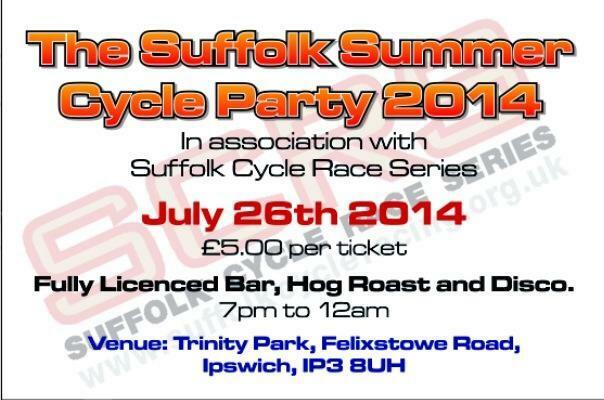 The Cycle Summer Party 7pm-12noon at Trinity Park, Ipswich. Save the date NOW. Tickets are now available to purchase at only £5pp!! 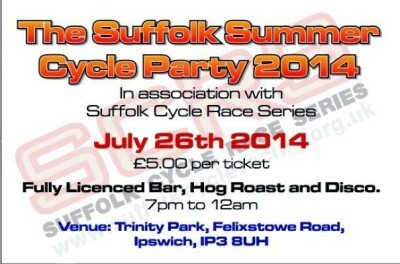 Please come and join us to create the biggest and best Cycle Party possible! .. Great venue, great music, great Hog Roast and a fully stocked licensed bar !! Please LIKE AND SHARE and spread the word..
Ipswich Bicycle Club’s last open open Coached Road Training for the summer is Saturday 7th June, at RAF Woodbridge Airfield Otley Road, Sutton, Woodbridge, Suffolk, IP12 3TN. Phil, Ross and Pete will be on hand to welcome you. These open sessions run from 10am-12noon for riders aged 7yrs+ incorporating Adults too. Please arrive no later than 9.45am and congregate at the end of Otley Road once in the gate will be shut behind us once we enter the airfield due to site security. If you are going to attend please could you drop a quick email or text to coachedtraining@ipswichbicycleclub.co.uk 07880 601396 letting us know. Don‘t forget your bicycle (in full working order), helmet, drink, £2.50 per rider and appropriate clothing for the weather. For the remainder of the summer we will be concentrating on the Suffolk Cycle Racing Series 11th June – 16th July incl 12th July. MSG Mountain Bike Series http://www.mudsweatgears.co.uk/ Next rounds 13th April and 18th May with another 5 into September. Ipswich Bicycle Club’s next open Coached Road Training is Saturday 31st May, at RAF Woodbridge Airfield Otley Road, Sutton, Woodbridge, Suffolk, IP12 3TN. Phil, Kirsty and Adam will be on hand to welcome you. Adults will be running race drills to help with line judging training for the Suffolk Cycle Racing Series. Youths will continue the onminum style coach led racing with short and longer races. RAF Woodbridge is a very exciting venue and the site has been used previously for Road Circuit Racing by local cycle clubs. This new site offers an excellent opportunity for some great race training ahead of local Crit Racing at Trinity Park – links and dates below. Ipswich Bicycle Club’s next open Coached Road Training is Saturday 24th May, at RAF Woodbridge Airfield Otley Road, Sutton, Woodbridge, Suffolk, IP12 3TN. Phil and Adam will be on hand to welcome you. The session runs from 10am-12noon for riders aged 7yrs+ incorporating Adults too. Future coached training sessions will be held on the following dates.